Dutch singer songwriter and folk musician Margot Merah hails from Paasloo, a small township in northeast Netherlands. 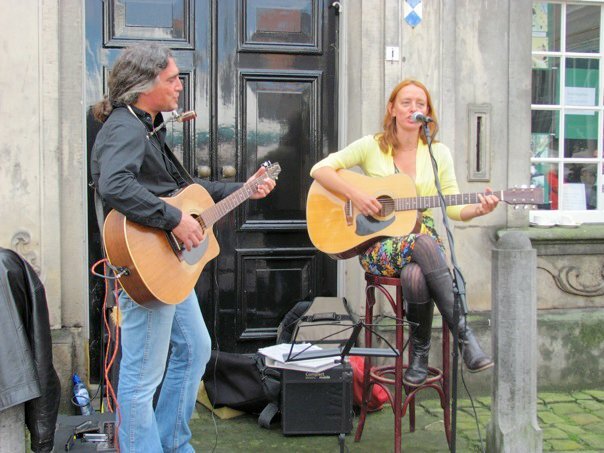 Currently based in Amsterdam, Margot has been singing and touring extensively around Europe, Australia and the US for the past 15 years. Margot’s hauntingly rich alto voice and unique approach to both songwriting and traditional folk music arrangements are what make her a truly compelling and inspiring performer. Her love of writing and of words is evident in her own original songs and in the songs she selects from the vast traditional repetoire. The story is what compels her both as a writer and interpreter of other peoples songs. But her innate musicality and unique approach to singing and guitar playing cannot be denied. Years of touring as an accompanist on guitar for traditional harpist Ed ten Hoedt along with her interest in a wide variety of styles from country to blue grass, pop and rock, serve as a rich foundation upon which she has created her rare and compelling style of music. With Sophie ter Schure Margot plays traditional and contemporary folk music and originals as The Lasses. Two female voices in tender harmony! The harp/guitar duo Sunflower has been going ever since 1999. They have recorded cd’s, played the streets all over Europe and Australia, performed on festivals, art events, in pubs, clubs and theatres. Lovely tunes to soothe the soul.